The Stopwatch is an innovative function, allowing you to mark the beat of an animation or a soundtrack. allows you to start the stopwatch. Press again to pause it. marks the beat measured by the stopwatch. Enable Metronome to beat with a little sound. 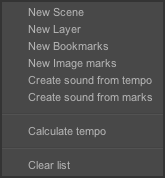 You can choose the Tempo by entering a numerical value (in frames per second). Link to playback allows you to read your animation and the stopwatch at the same time. Do not forget an instance has to be created before marking it. * Calculate tempo change the metronome's tempo, following the beat you marked. * Clear list delete the beat list.